Long considered the perennial sons of British 1980s post punk, Editors have never quite been able to shake off the Depeche Mode and Joy Division comparisons that are a near constant every time their name is mentioned. Embodying a haphazard approach in their output, such as on the simmering synth gloom of In This Light and on This Evening and the brooding guitar rock of An End Has A Start, means Editors aren't as easy to pin down as they might seem at first glance. The unerring gloom that is a mainstay of their sound has the potential to becoming cloying, but to singularly reduce Editors to a distant tribute band to Ian Curtis and co is to underestimate the strides the Birmingham band have made since their 2005 debut The Back Room. Ten years after their first LP, In Dream finds the five-piece further exploring the experimental electronic vignettes that first appeared on 2009's In This Light and on This Evening. The creeping, building expanses that frame In Dream lend themselves to a slighted and dissolving world that's falling out of lead singer Tom Smith's grasp. Think Banksy's Dismaland with less politics and more emotion. The crackling guitars on "No Harm" suggest that this is not a complete departure from their last album, 2013's The Weight of Your Love, but there is an undeniable shift into less sparse and more anthemic territory on In Dream. The weighty yearning of "Salvation" fuses flourishing strings and keys with melodic synths, managing to sound both authoritative and fearful. There's a more keenly developed sense of who Editors are as band here, with a renewed confidence and self-assuredness that wasn't as apparent on their previous releases. The immediately enveloping vigour of "All The Kings" conjures up a militaristic marching song, while Smith's vocals swerve between despondent and soaring in a way that hasn't been as well demonstrated before. The oozing pleas of "don't let it get lost" on "At All Cost" sound earnest and regretful, with Slowdive's Rachel Goswell lending backing vocals to the sombre malaise. As seems to be an unfortunate yet frequent side effect when bands try to kick off a more radio-friendly turn, the lyrics sometimes stray into cringe-inducing cliché (there's chants of "hold on" and "don't stop believing" that make an unwelcome appearance), which upsets the looming atmosphere that makes In Dream so easy to be receptive to. There are moments of positivity here, that always have a lurking downfall that's never far behind. For the same reasons people seem to embrace the gloom that harnesses the output of so many post punk revivalists, In Dream does carry weight and impact. The soaring, extroverted temperament of "Marching Orders" shows a degree of finesse that will quickly enthral anyone who listens. 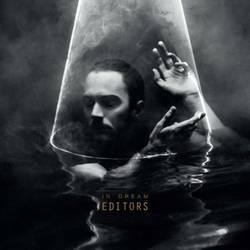 It seems that with In Dream Editors may finally get the ever elusive recognition that sees the band emerge from the shadows of the bands that influence them, and instead be recognised as a separate entity. Posted Sept. 28, 2015, 8:38 a.m.